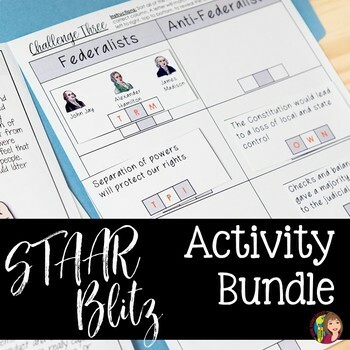 This is a comprehensive plan and resources for 2 weeks of a US History STAAR review. If you do not have two weeks, you can choose the review activities that support a majority of the test (Constitution, Industrial Revolution), review thematically (people of US History, eras of US History), or that your personal data indicates is an area of weakness for your students. This plan is designed to intentionally review vocabulary on a consistent basis throughout the two week period – even if you only take 5 minutes a day, use the Word Wall terms to review important content vocabulary. Many of the days are set up into station activities – depending on the level of your students, you might want to direct certain students to certain games during a class period. Have extra games left over? Use them in your after school tutoring or share them with other teachers to use right before the STAAR test. © 2019 Social Studies Success, LLC. This purchase is for you and your classroom. Duplication for an entire school, an entire school system, or for commercial purposes is strictly forbidden. Please have other teachers purchase their own copy. If you are a school or district interested in purchasing several licenses, please contact me for a district-wide quote. Do not share this document with Amazon Inspire. Please review all product descriptions and previews. If you have a question, contact me before you purchase at SocialStudiesSuccess1@gmail.com. As this is a digital product, all sales are final.